It’s Musical Theater! So it’s ok… right? This week we have the great opportunity to delve into the history of our community at St. Olaf by looking through the well preserved archives of the college’s student newspaper, the Manitou Messenger. The “Mess” as it is often referred to by current students captures events on campus and student news ranging from academia to athletics and yes, music. 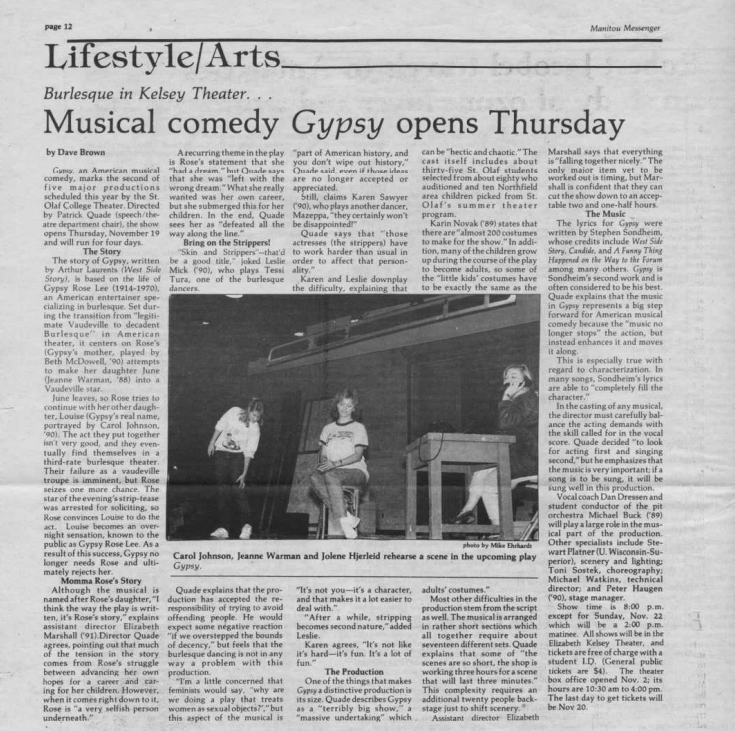 From our class discussion on American musical theater, I thought it would be interesting to look into the history of our theater department and it’s musical productions and my search yielded an article about the St. Olaf performance of Gypsy in 1987. Gypsy, a 1959 musical with book written by Arthur Laurents, music by Jule Styne, andlyrics by Stephen Sondheim, is based on the life of Gypsy Rose Lee (1914-1970). Rose Lee was an entertainer who specialized in burlesque, a style of dramatization intended to cause laughter. The musical centers of Gypsy’s mother who attempts to turn one of her daughters into a Vaudville star. Rose, Gypsy’s mother, eventually convinces her younger daughter Louise to do a striptease on stage which catapults her into fame. 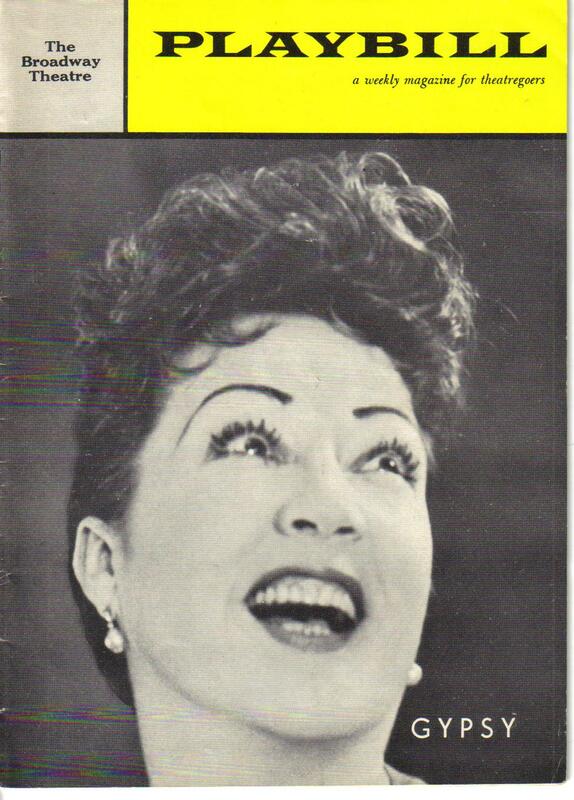 Louise soon becomes known as “Gypsy Rose Lee” and eventually rejects her mother’s assistance in her ascent to stardom. Our course this semester we have talked about a wide array of political and societal issues concerning American music and musical theater is no exception. Setting a story to music and then putting that story on stage adds multiple layers for contention. Women in music has been a common point of interest for the course and Gypsy puts a controversial topic at center stage. Director Patrick Quade stated that “the production has accepted the responsibility of trying to avoid offending people” when asked about the musical’s touchy subject. The arts often provide the opportunity to push the envelope and Quade certainly took that opportunity. My favorite quotation from Professor Quade addresses the controversy directly as he states: “why are we doing a play that treats women as sexual objects?… This aspect of the musical is part of American history, and you don’t wipe out history.” For Patrick Quade, the purpose of putting on a production of the musical Gypsy was not to spark an uproar, but to spark a conversation. Examining musical theater and the progression of musicals as a form of entertainment provides a hefty amount of insight into not only the musical style of the time period, but also the issues of the era. These conflicts are preserved though the musical work and provide the unique opportunity to serve as entertainment and as an educational tool with each production. Brown, Dave. “Musical Comedy “Gypsy” Opens Thursday.” Manitou Messenger, November 6, 1987, Lifestyle/Arts sec. Accessed April 21, 2015.